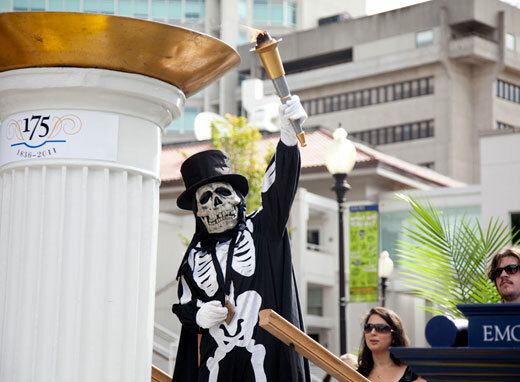 Dooley, the spirit of Emory, lights the cauldron at a 175th anniversary event with a symbolic flame. On the heels of Emory's 175th anniversary celebration in 2011, a much-anticipated documentary of defining moments in the University's history will be unveiled during Founders Week 2012. The annual academic festival, from Feb. 6 to the 11 this year, will feature a sneak peek of the documentary, which is expected to air on Public Broadcasting Atlanta (PBA) later this spring. The hour-long film, "Wise Heart: The Growth of a Great University in the Deep South," features interviews with key University leaders, including President Jim Wagner and Board of Trustees Chair Ben Johnson III, along with historical photographs and footage. "We have a director's cut, so it's not quite ready for primetime," says Gary Hauk, vice president and deputy to the president. Previews of the film are scheduled for Feb. 8 at 4 p.m. and 10 at noon in the Jones Room of Woodruff Library. Founders Week recognizes the founding of Emory College in 1836. For a schedule of events and activities, see Founders Week schedule (PDF). Events are free and open to the public. Other highlights include the 17th annual Distinguished Faculty Lecture, "Me and Joe McCarthy: Studying American Communism," on Feb. 6. Andrew W. Mellon Professor of Politics and History Harvey Klehr will discuss how scholars responded to new evidence released after the Cold War detailing Soviet espionage and the relationship between the Communist Party of the U.S. and the U.S.S.R. Klehr will address the perils of such research in a politicized and ideological field and how it affects the public's understanding of the former U.S senator's crusade against communism. On Feb. 8, Luke Timothy Johnson, Robert W. Woodruff Professor of New Testament and Christian Origins at Candler School of Theology, will explore "Jesus and the Law of Marriage and Divorce," in the McDonald Lecture in Christianity and Law. Johnson will show how a patient examination of the Gospel of Matthew reveals a rich and complex understanding of how the Torah and the figure of Jesus intersect. Sponsored by Emory's Program in Democracy and Citizenship, Yale history professor Joanne Freeman will present "Dirty Nasty Politics in the Early Republic" on Feb. 9. Freeman will trace the decade leading up to the election of 1800, which was punctuated by political mudslinging among Federalists and the Republicans in an untested republic. The two prevailing political parties hurled character attacks, reveled in the paralysis of analysis and couldn't even agree on what to call the national leader. While Emory's official birthday party is over, Founders Week commemorates that transformational partnership of heart and mind that occurred one Saturday in December 1836, when a group of Methodists received a charter for a college. "In a way, we're putting the 175th anniversary to bed," notes Hauk. "But we continue to reflect on the aspirations of Emory's founders as we turn to the future."